It looks like the ’80s aren’t done coming back this decade just yet. If you thought Christina Aguilera and her acid-wash jeans obsession was extreme, wait ’til you see Gwen Stefani. The trendsetting singer, songwriter, and fashion designer was spotted shopping for party supplies with her boys last July 4. Gwen kept 4-year-old Kingston and 2-year-old Zuma cool and comfy in summer boots, while she wore hammer pants — in denim. Now, I have nothing against harem pants, and Gwen’s actually been rockin’ quite a few of them and looking really good in them lately. 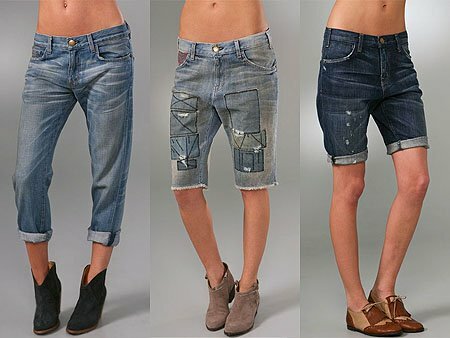 However, I think the whole point of harem pants is to keep your legs cool, and I don’t think you can achieve that if they’re made of heavy denim. Also, Gwen’s jeans may be a collaboration between designer extraordinaire Jean Paul Gaultier and iconic denim brand Levi’s, but let’s face it, the cut and the design are unflattering. They look atrocious even on Gwen Stefani who is already known for her unique sense of style and even on this model whose body is pretty much the ideal type for women everywhere. If she can’t make these pants look good, who else can? If you think you can, these pants are available for $435.00 at Bergdorf Goodman. Like I said, I have nothing against harem pants. But if I were going to wear them in denim, I’d go for these drop crotch/boyfriend jeans from Current/Elliott instead. These would be so much easier to style and wear!